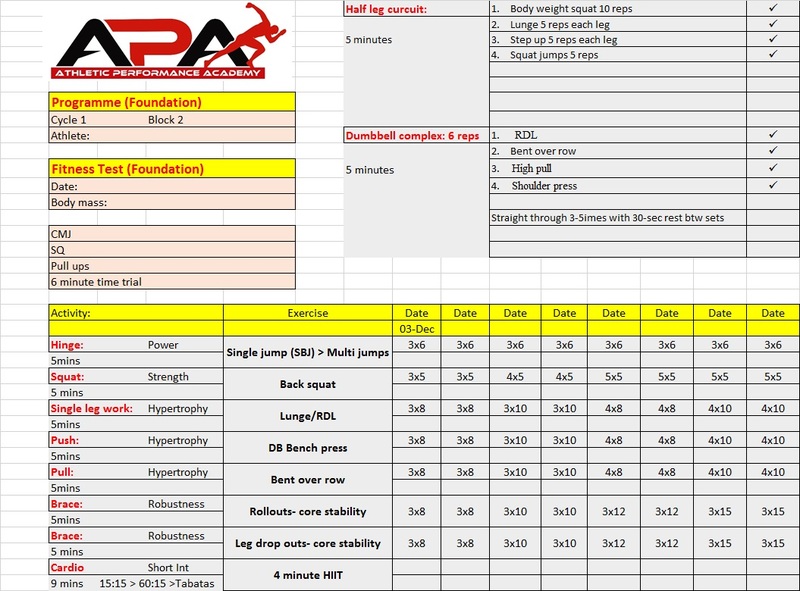 Get a Years Worth of Training Programmes FREE right HERE! Yes that’s right- I’m giving a year’s worth of training away for FREE. I thought I would give my regular blog readers a treat and record some of the programmes to video we have been successfully using with our Adult Group Fitness training session on a Tuesday night. Want to have more success in sport? 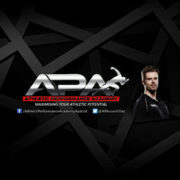 At APA we believe that the best way to improve faster and win more is to get fit for your sport. Our 12 weeks to Peak Training Programmes are designed to maximise your athletic potential and get you in peak physical condition. We get you fitter, faster and stronger so you can excel in sport and in life! The above elements make up the Performance Phase and would be suitable for someone who has significant training experience and would complete this in their off-season. Where athletes have limited training experience or need to achieve mobility/weight loss goals first they will need to complete our Foundation Phase from the beginning: Here they will do the mobility and body weight strength programme before doing the muscular endurance strength programme. Don’t worry. Even if you don’t have any sporting goals now, we recognise that everyone has something they want to achieve and we believe our Peak Performance Training programmes can help everyone achieve their goals. We just need to find out what yours are!! For someone with limited training experience we would typically build up their training over 24 weeks so they have more time to adapt to the increases in intensity. This is typically what most of the Adult Group class members will do. 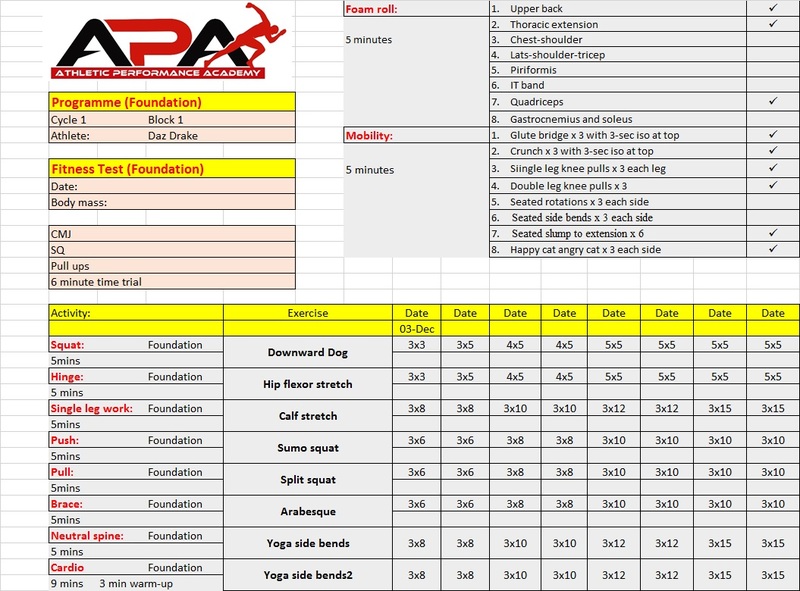 If you haven’t done anything for a long time, or are very de-conditioned you will need to do the mobility programme and body weight strength programme first. 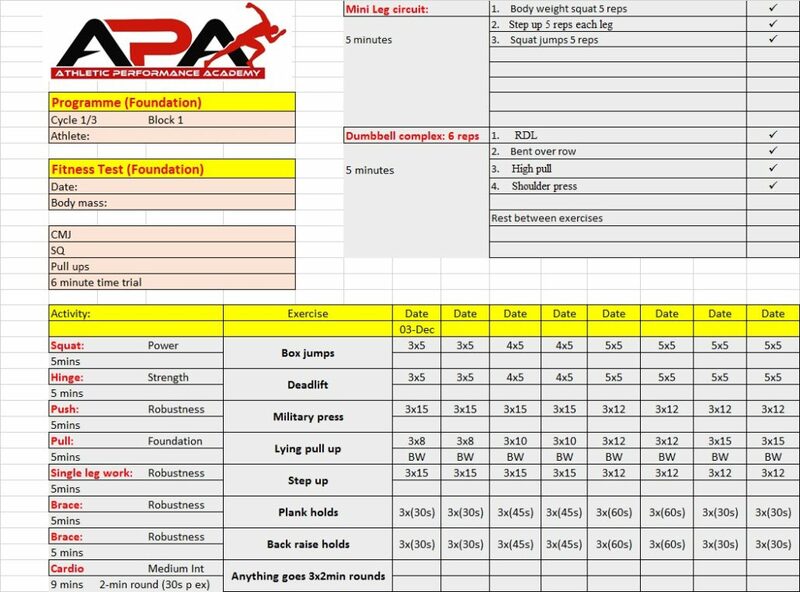 Follow the progression below completing 4 weeks at each block in Cycle 1 until you have done 12 weeks. Then have an active rest week (1 week only!) before moving on to Cycle 2. Repeat this until you have completed all four Cycles. The idea is that by the time you complete 6 months (end of Cycle 2) you will have achieved your first peak performance- you will be in peak physical condition. But just like a climber who reaches the top of Everest they need to come back down to rest before they can give it another go. Hopefully the second time you will be better for the experience and surpass your previous peak condition- lifting more weight, being more explosive etc. To get the best results we recommend doing at least 2 x sessions per week separated by at least 48 hours. The programmes below are written on this basis, with 8 workouts over 4 weeks. Rest periods between sets vary according to the sets and reps carried out. They are typically 30-seconds for MSE and body weight strength and increase to 60-seconds for hypertrophy and 90-seconds for strength and power exercises. In the hour we aim to cover the entire spectrum of fitness demanded by sport- power, strength, muscular endurance, and cardiovascular endurance. 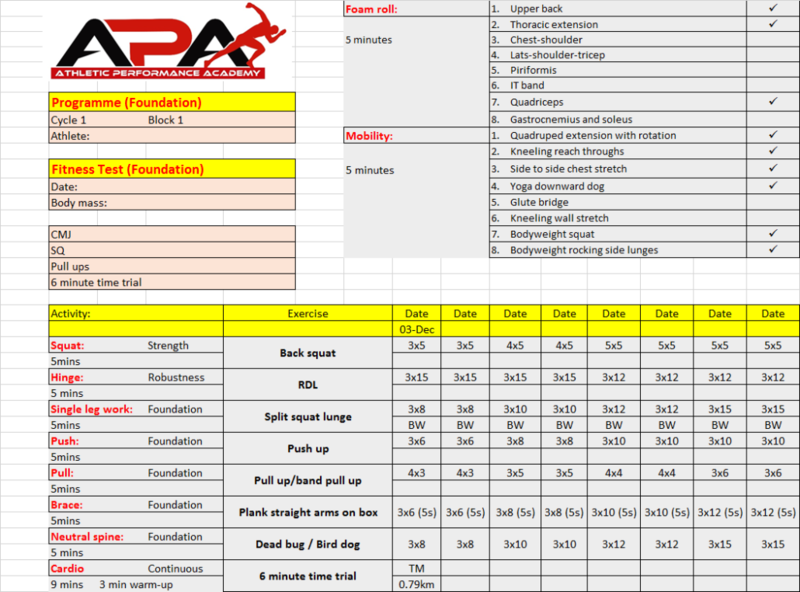 So there it is- a full year’s training programme ready for you to get started with. Feel free to drop me a comment for more details on the cardio component. The serious and committed athletes out there will get in touch. Alternatively we can also support you remotely with our online support packages so please feel free to contact me if you are interested in that too. 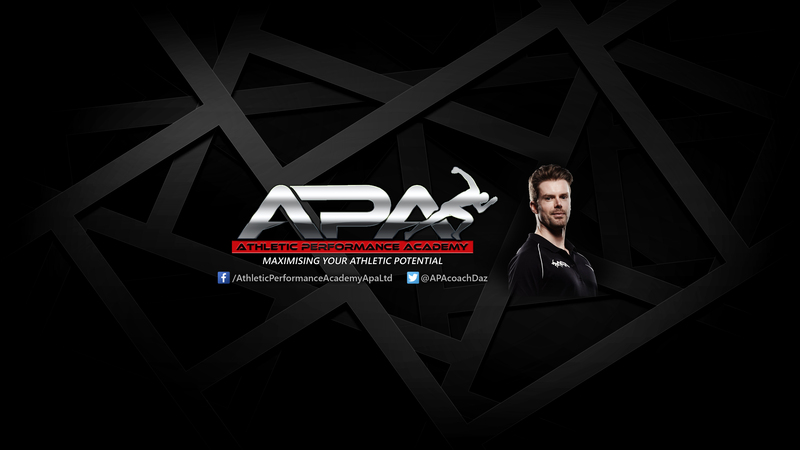 http://athleticperformanceacademy.co.uk/wp-content/uploads/2016/07/YoutubeChannelArt-1.jpg 1440 2560 dazdrake http://athleticperformanceacademy.co.uk/wp-content/uploads/2015/05/APA-Logo1-300x156.jpg dazdrake2016-07-14 16:44:212018-05-27 20:12:41Get a Years Worth of Training Programmes FREE right HERE! Perception is the new frontier of athletics? I have been wanting to write about this for a few weeks. Lately there has been a lot of press again about the next ‘new’ predictor of athletic performance. It seems deliberate practice has been replaced with new hype on the importance of ‘perception.’ If I sound a little derogatory I apologise but for those of you who know me, you will appreciate I am very reluctant to give too much kudos to one aspect of performance when it comes to predicting success in elite sport. Is my child going to make it? Can it ever be any better than a 50:50 best guess? Check out the full article here on a A new meta–analysis in Perspectives in Psychological Science which looked at 33 studies on the relationship between deliberate practice and athletic achievement and found that practice just doesn’t matter that much. 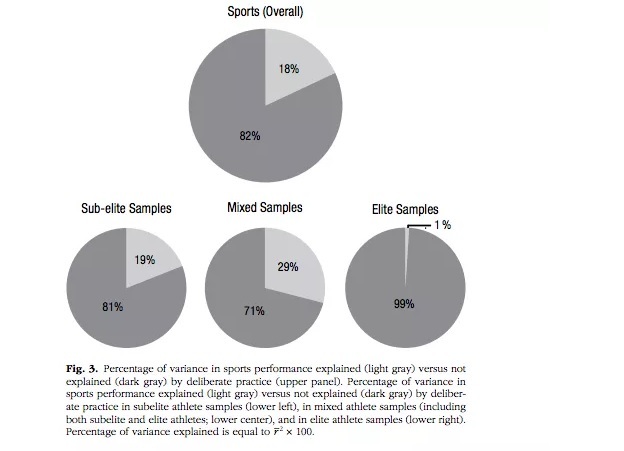 I really like the fact that it summarises that practice accounts for only 18% of the difference in athletic success between elite and sub elite athletes. Basically it is saying that practice time only accounts for 18% of the reason why someone is better than someone else. Personally I have always been comfortable with this idea that talented athletes just pick up skills sooner. Talented athletes have faster learning rates, a concept I like to compare to internet download speed- some athletes just dial up and process the information faster. Some people are just slow learners. It’s this focus on cognitive abilities that I would like to comment on. My caveat is that this is just one part of the development pathway, just like psychological and physical development, cognitive development needs to be addressed too. 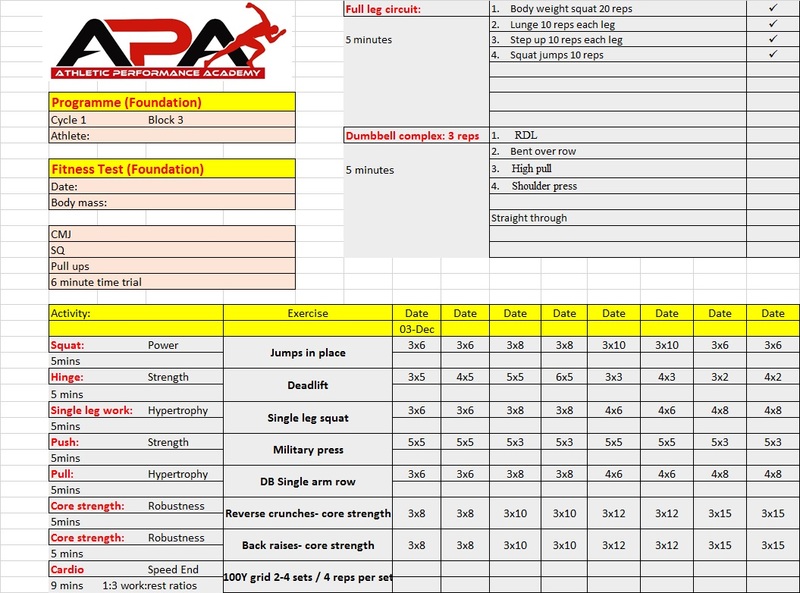 Click here for the discussion of the programming components that should feature in an appropriate neuromuscular training programme. Different sports place different demands on your decision making processes- the trajectory of different shape and speeds of balls (tennis ball versus basketball versus rugby ball), opponents, dimensions of pitches, and time available to make the decisions. But there is nothing wrong in my opinion in training contextual decision making by trying to simulate elements of the sport while doing speed. That’s why decision making features early in the APA speed development pathway (See Level 3- which is typically the time around puberty). See below for how the skills are first taught in isolation then once we establish stable efficient motor skills we then add the performance layer where we test them under conditions of complexity (link skills together) and also decision making. Combinations: focus on linking together various footwork patterns/directions. Can also include obstacle courses that weave together different challenges one after the other. Randomisation: challenge the decision making skills of the athlete using tasks that focus on a specific aspect of speed. Can also include use of chaos games. This is not to say we won’t do any decision making prior to puberty. Of course we do- it’s just to highlight the emphasis. So what does this mean for training? I say- yes that may be true but it is still presenting a neuromuscular overload. But what are the advocates of another approach saying? 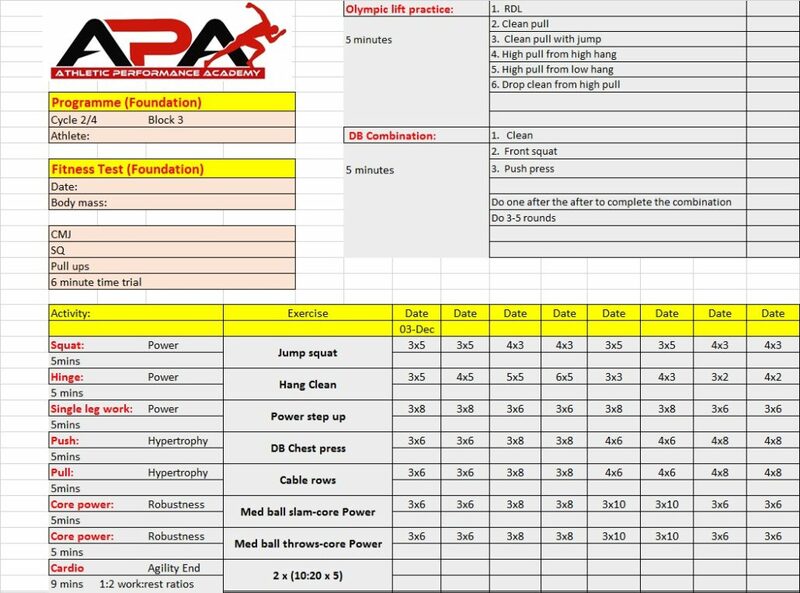 But while I really like the concept of training reactive agility, I don’t think this is the holy grail of athletic performance that some people are making it out to be! The physical components referred to in the video above take time to develop, both in terms of kinetics (magnitude of force- capacity) and kinematics (direction of force-mechanics). Here is a great video highlighting the importance of coaching correct kinematics in change of direction mechanics. I think this is vital and I hope coaches value its importance. Pay attention. I’m a bit concerned that former Manchester United Power development coach Mick Clegg said Christian Ronaldo never lifted heavy weights as it would detract from the skill development work. My standpoint is that a programme should always be balanced and work aspects of the entire Force-Velocity Curve. What do you typically see in Football? I think there is a lot of good quality ‘quickness’ work on display here. Is it explosive? No. Disagree? Check we are using the same definition of ‘explosiveness.’ See a great article here from Science in Sport on the Force-Velocity curve and further explanations of training methods to develop it. I still think all sportmen and women should be doing strength training and as long as it is planned properly you need to do heavy weights to guarantee you are overloading the Force component of the Force-Velocity curve, as well as doing moderate weights, at moderate speed, and fast movements at fast speed, including weights, bungees, and even bodyweight fast feet drills.. There you go- variety is the spice of life. Rant over! http://athleticperformanceacademy.co.uk/wp-content/uploads/2016/07/Early-Sport-Specialisation.gif 438 440 dazdrake http://athleticperformanceacademy.co.uk/wp-content/uploads/2015/05/APA-Logo1-300x156.jpg dazdrake2016-07-10 16:39:292018-05-27 20:12:41Perception is the new frontier of athletics?